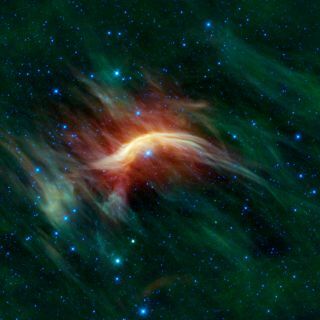 This infrared image from NASA's WISE telescope shows the runaway star Zeta Ophiuchi as it creates a bright shockwave (yellow arc) in an interstellar dust cloud as it zooms through space. A huge star ejected from a binary system has been photographed slamming headlong through a barrier of cosmic dust, creating a shockwave that shines in brilliant yellow in infrared views. The star, called Zeta Ophiuchi, is a stellar behemoth with about 20 times the mass of our sun and would be 65,000 times brighter if it weren't surrounded by a thick blanket of dust. It is about 4 million years old and is 460 light-years away from Earth. The star is zooming through space at a whopping 54,000 mph (nearly 87,000 kph), according to NASA scientists. NASA's Wide-field Infrared Survey Explorer, called WISE, caught the massive star plowing through thick dust to create what scientists call a "bow shock" – a shockwave that precedes stars as they move through space much like the ripple raised by the front of a boat traveling through water. In the new infrared image of Zeta Ophiuchi, the star appears as a hot, bright blue light streaming through a vast cloud of interstellar gas and dust. The image's colors are artificial – generated by infrared measurements rather than optical observations. In the visible range of the light spectrum, Zeta Ophiuchi appears as a relatively dim red star surrounded by other dim stars. The envelope of gas and dust is invisible in those views. But in the infrared range, Zeta Ophiuchi is a cosmic spectacle. The giant star appears at the center of a bright yellow arc of dust. The arc is shaped by the powerful stellar wind thrown off by Zeta Ophiuchi. As the star moves through space, the stellar wind compresses the gas in front until it forms a hot shockwave (the bow shock) that glows extremely bright in the infrared. "This feature is completely hidden in visible light," WISE scientists wrote in a description. "Infrared images like this one from WISE shed an entirely new light on the region." Astronomers think Zeta Ophiuchi wasn't always a loner star. Most likely, it was part of a binary system that was ripped to shreds when Zeta Ophiuchi's partner – an even more massive star – exploded in a supernova. The resulting blast catapulted Zeta Ophiuchi through space. A similar supernova end awaits Zeta Ophiuchi. The star is expected to last another 4 million years before it consumes all of its fuel and explodes, according to WISE scientists. NASA's WISE observatory is a $320 million space telescope that launched in December 2009. The infrared telescope has been working to record detailed maps of the sky ever since. The telescope completed its primary mission to map the whole sky 1 1/2 times by October 2010, when it ran out of the coolant it needs to keep some of its instruments chilled. But the observatory is still able to observe astronomical objects in two infrared channels that aren't affected by warmer temperatures.